When it comes to a truly special event, you need the top catering Dallas has to offer. Southern Star Casino Events has top of the line, professional catering that will make your event shine. Whether it’s a cocktail party, a convention, or a holiday event, our staff will meet and exceed your expectations. Southern Star Casino Events provides a wide variety of food & beverage catering, all handled by our professional catering staff. 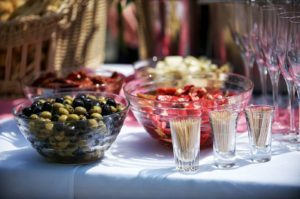 We take pride in employing some of the best caterers Dallas has to offer, because we know that food can make a huge difference in the quality of your event. Upscale Dallas events need a unique atmosphere like none other – and Southern Star Casino events provides an experience your guests won’t soon forget. We provide a variety of food & beverages, anything from unique, intimate appetizers to a full-scale dinner menu. Southern Star Casino events proudly serves the DFW, Dallas, Collin, and Tarrant County areas with incredibly affordable prices for unforgettable event catering. Impress your guests without spending too much out of pocket. In addition to catering Dallas casino events, Southern Star Casino Events also provides professional event staffing and tournament setup for truly memorable occasions. Staffing helps give your guests the full Las Vegas casino experience, with bartenders and servers who handle all your event staffing needs. Tournament setup includes everything you need for a full night of poker excitement and fun! Professional dealers, casino style chips, handcrafted Hold’em tables, and quality layouts & copag cards all contribute to the casino experience. No matter where you are in Dallas, you can lean on Southern Star for the exciting, memorable night you are looking for! With professional catering, staffing, and tournament setup, you can leave everything in our capable hands.